Dana and Dexter Smith were brothers who grew up in Seattle, Washington. Dana was the oldest and Dexter the youngest. They were signed up with Imperial Records who also had Ricky Nelson and Fats Domino among their lineup or recording artists. 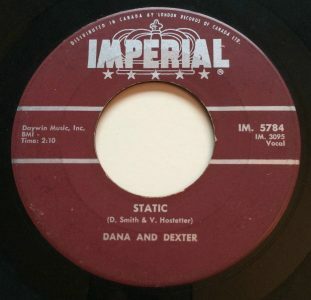 Imperial seems to have given little promotion to the brothers when they released their one single on the label, “Static”. Almost nothing is known about the pair some 57 years after their only single release that made the Vancouver pop charts. bom, bom, bom, bom, bom. you are just a little late. Or will we end up in a fight? or shall we go and make romance? and by that time our evenings’ shot. that was a night I’ll never forget. now all we ever do is fight all night! I guess I’ll get another date. “Static” was a song co-written by Dana Smith. It was a B-side all about communication problems and with someone you’re dating. The couple have issues regarding punctuality: he’s on time and she’s late. He makes decisions quickly and she needs to weigh all the options. When they try to decide what they want to do on a date they usually end up getting into an argument. It appears that Janie, the love interest of the guy singing the song, is makes her own plans to stay out late without letting him know what she’s doing: “When I call you for a date you’re mother says you’ll be out late…I guess I’ll get another date.” As a couple, they aren’t checking in with each other about their respective upcoming plans in the days ahead. The frustrated guy decides to end the drama and get another date. The term, static, can mean several things. It can be used as an adjective to refer to a circumstance that is lacking in movement, often in a stuck way. It is also a noun that refers to crackling or hissing noises on a telephone, radio, or other telecommunications system. While the couple is bogged down in a static state of constant bickering, it is the use of the word static as a noun that is intended in the title. The hissing noises are apart of the arguing. Being in this dating relationship is like having the radio dial always out-of-synch with the radio station you want to tune into. The result is a lot of static on the radio dial making it hard to hear and be in tune with the radio frequency. In her article, “5 Signs You’re in a Dead-end Relationship,” Anita Naik writes that one of these signs is bickering. Arguing all the time is not necessarily a sign that your relationship has hit rock bottom. It depends what the argument is about. However, constant petty bickering often is a sign that consideration and respect for the other person has evaporated. When your partner is just being rude, bitchy, derogatory, it might be time to call for a time out on the off-putting remarks. If you can’t call a truce for a week, time to cut ties or seek therapy. “Static” made it’s way onto a CD 50 years later called Rare Rock n’ Roll Tracks of the ‘50’s and ‘60’s. Vol. 6. The A-side of “Static” was a song titled “Here Comes My Baby”. The A-side and B-side charted in the same position the first two weeks on the CFUN chart. Then, “Here Comes My Baby” charted independently on the CFUN chart, peaking at #23, for a briefer chart run than “Static.” The A-side was not the Cat Stevens penned song that was a hit for The Tremeloes in 1967. “Static” was a hit only in Vancouver, BC. It didn’t chart anywhere else in North America. Dana And Dexter’s single was published with Daywin Music Inc., a publisher affiliated with BMI. Daywin published nine singles for Doris Day. They published several of Paul Revere and the Raiders biggest hits, including “Kicks”, “Hungry” and “Good Thing”. Daywin also published “Hey Little Cobra” for The Rip Chords in 1964. Dexter Smith went on to work for Boeing in Seattle. Anita Naik, 5 Signs You’re in a Dead-end Relationship, Net Doctor.co.uk, London, UK, February 19, 2018.